Oh My Heavenly Hair vegan beauty products (OMHH) lives by the rule that organic and vegan does not have to mean “crunchy granola,” and in fact, can even be chic. Free of nasty chemicals like sulfates, their vegan and cruelty-free hair products are full of nourishing ingredients such as vitamins, panthenol, herbs and organic botanicals. Following the philosophy of the ancient Indian holistic healing tradition, Ayurveda, OMHH deeply values their non-profit giving programs as a way to be healthy on the outside and the inside. Since the donations they make come from profits made by products you purchase, they are passing part of the good giving feeling on to their customers. Because OMHH offers products with such pure ingredients, they are good for many parts of your body. Take their Fabulously Therapeutic Vegan Hair & Body Wash, which is made of such gentle and nourishing ingredients that it can be used on both body and hair. Containing organic aloe and lavender, roman chamomile, as well as vitamin E and pro-vitamin B5, this hair and body wash is packed with beneficial ingredients to feed your hair and skin. Essential oils impart a beautiful and calming scent to give you the spa experience in your own shower. After you use the Fabulously Therapeutic Vegan Hair & Body Wash, finish your hair with OMHH’s Fabulously therapeutic vegan conditioner. Feed your hair luxurious ingredients such as organic green tea, blue green algae, organic lavender and organic slippery elm. Aimed to specifically treat damaged and brittle hair, this conditioner will leave your hair soft and smelling amazing with its citrus scent. 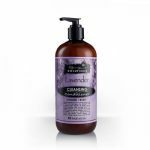 Citrus Lavender – including orange peel, rose hips and annatto seed. Ginger Tea – including rosemary leaf and lemongrass. Healing Shea – including shea butter and oats. I Love Peppermint – including alfalfa, parsley, wheat grass and barley grass. Spicy Oatmeal – including organic oats and cloves. To learn more about Oh My Heavenly Hair vegan and cruelty-free beauty products, visit their website.